Anyone who has upgraded to a new phone has grappled with the question of what to do with the old one. Stick it in a drawer somewhere? Toss it in the bin? On average in Australia, 3 to 4 million mobile phones each year face one of these two fates. 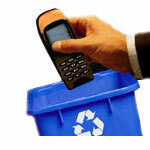 However eventually, as time passes, all of the phones will end up in landfill. 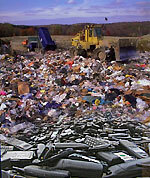 To take the easy option, and not to recycle the estimated 10 million mobile phones in stockpile, and keep on filling big holes in the ground with toxic substances that decompose, forming poisonous liquids that can seep into groundwater and then into rivers and streams is damaging to the environment and is associated with adverse human health effects. 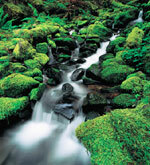 Further, decomposing waste creates methane gas and C02. Methane gas is 21 times more damaging than C02, the principal contributor to global warming. Our rubbish and the way we handle it is a contributing to the upward shift in the planet's temperature that causes extreme weather conditions. Landfill is not sustainable and by continually filling up our tips with unnecessary rubbish will create a long term pollution risk to the environment. It reduces pollution caused by hazardous materials from mobile phones entering the environment from landfill or incineration. extraction of raw materials like plastics. It is a simple, effective and socially rewarding thing to do. such as dioxins and furans in the exhaust gas stream. It reduces disposal rates and impact.